I would also like to take this time to let everyone know that Foodbuzz is holding a fund raiser for Share Our Strength, No Kid Hungry. All you haven to do to help this cause is make Yahoo your home page, just click on this Yahoo link. that’s all you have to do, and you can help raise $20,000 to help fight childhood hunger in America. Now lets get back to why you’re here today, its Guest Post Friday!!! Today I get to share the spotlight with my friend and Philadelphia Neighbor, Lindsay from Eat, Knit, Grow . Lindsay is quite the accomplished home chef and she will consistently wow you with her culinary creations that run from Crusted Tilapia to Peanut Butter Snickers Cookies (two of my personal favorites!) One thing for certain, you’ll never leave Eat, Knit and Grow without seeing something that you’ll want to make at home and share with your friends, and that’s what good food is all about. So sit back, relax, put your feet up and start your stomach rumbling as I give you Lindsay and……. 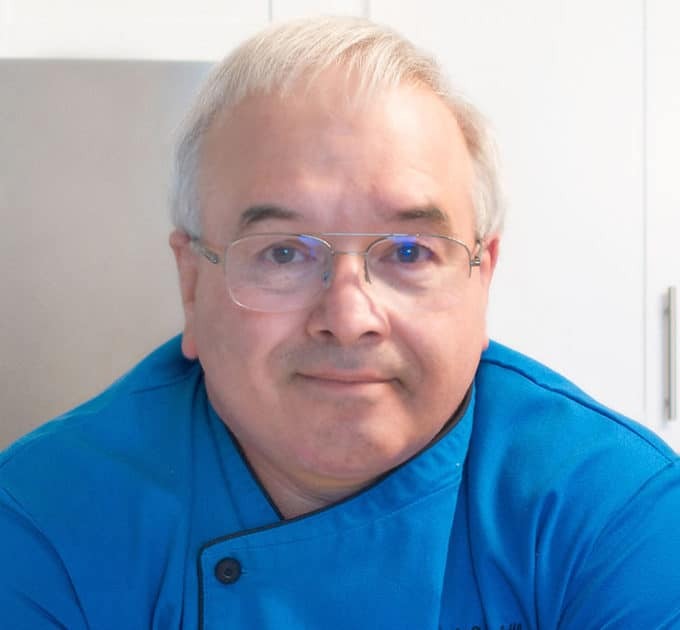 Thank you so much to Chef Dennis for inviting me to guest post Friday. I am extremely honored to be sharing my recipes, passion, and blog with all of his wonderful readers. I am a huge fan of Chef Dennis and of the guest post Fridays. I have discovered many new and amazing blogs this way and delighted to be joining the list! My blog, Eat, Knit, Grow started out as an outlet for me to talk incessantly about my garden, my crafting, and cooking when no one really wanted to hear it any more. Cooking quickly took over and absolutely pushed the other two off the front page (all though they are still in my life). I like to think, for the most part, my posts fall into two main categories: extremely health conscious and wonderfully seasonal, and over the top indulgences. I think that is a pretty good reflection of me, in general I like to eat sensibly and seasonally, but every once in awhile cheesecake is calling my name. I definitely began my culinary experiments as a baker. My brother and I loved to make cakes from boxed mixes when we were little. Soon we began adding our own toppings and mix ins, and eventually I graduated from mixes all together. Baking is my first love, the smell of cookies in the oven makes my heart flutter, so I knew I had to share something baked with you all. But, how to add in my sensible side, how do I sum up all my schizophrenic cooking passions into one single recipe? Then it hit me, a simple, healthy, but extremely delicious baked breakfast. So, without further ado, a baked oatmeal breakfast cake. 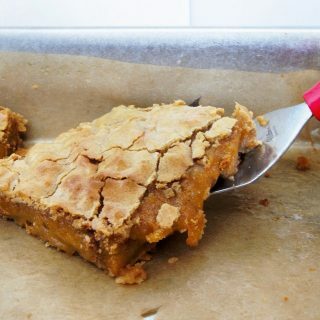 Preheat the oven to 375 degrees and lightly spray a pie pan or an 8 inch cake pan with non-stick spray. Mix together the oats, baking powder, and salt. In a small bowl beat together the maple syrup, milk, egg, and vanilla extract. Mix the wet and dry ingredients until well combined, then stir in the blueberries. Pour batter into prepared pan, and using a spatula smooth top until the batter is distributed evenly. 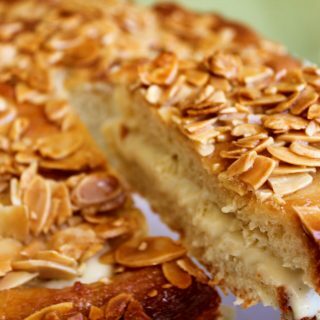 Slice banana, and top the cake with slices. Bake until just set in the middle, about 20 minutes then remove from the oven. Turn the oven up to broil. 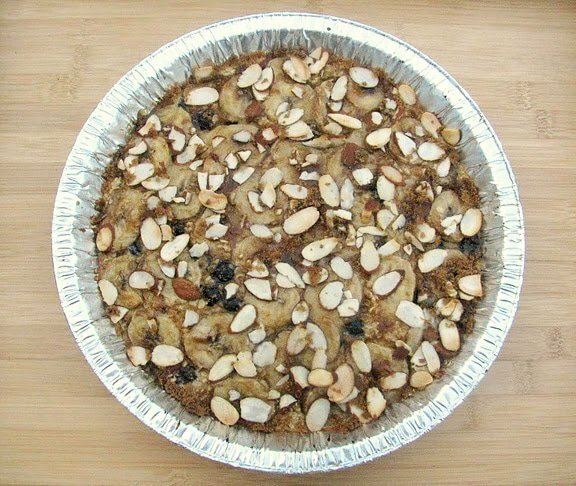 Top the cake with the brown sugar and almonds. Broil until almonds are golden and the sugar is fragrant, watching very carefully so the almonds don’t burn, about 2-3 minutes. Let cool slightly before slicing. Serve plain or topped with yogurt. I know everyone just wants to rush into their kitchen and start making this delicious cake! I can tell you it’s going on my menu at home and at school! But before you rush off to start baking please be sure to go by Eat, Knit, Grow and say hi to Lindsay, just remember to tell her chef Dennis sent you. Stay awhile and look through her posts, your going to be glad you did! home page . Please take the time to share this opportunity with your readers and followers. Thanks again for stopping by today and I hope all of you survive the heat wave were having and manage to stay cool, comfortable and well fed! This oatmeal cakes looks outstanding! Thanks for hosting another awesome Guest post Friday! 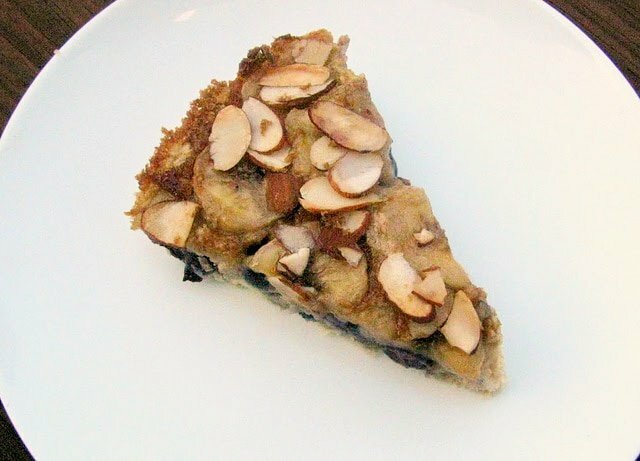 This cake looks super delicious with bananas, blueberries and almonds. Looks quite healthy too! 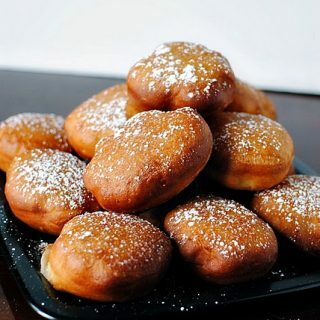 Grazie per la segnalazione di questo blog, il dolce è originale e molto invitante. Buona settimana Daniela. Hope you feel better soon Dennis! I love this cake recipe that Lindsay shared–such a great combination of ingredients! Thank youf introucing us to Lindsay! Amazing how many reasons there are for starting blogs. Knowing why they started makes us feel a part of what is going on and wow what a breakfast treat! Sunday mornings are treat time here and this will have center stage next Sunday! So simple to prepare and sounds heavenly! Cake for breakfast! I love the idea 🙂 I adore anything baked with oatmeal and fruit… This cake sounds perfect! Thanks for sharing, Lindsay, and nice to 'meet' you! Thanks for another great guest post, Chef Dennis! Hope it cools down soon & that you feel better too! One of my closest friends here in NC is sick too! I'm sorry Chef! 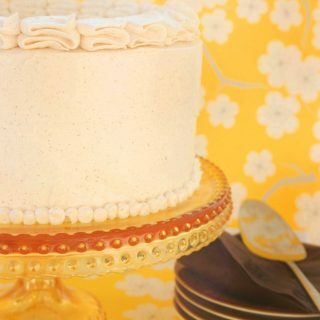 Lindsey, great cake and great guest post!!! Cake for breakfast…where do I sign up. This is a gorgeous cake, bet it smells amazing. Thanks to Lindsay for sharing her recipe and herself with us. Thanks to Chef Dennis for introducing us all to a new friend. Sorry to hear you are sick. Nothing worse than a summer flu. Take care of you! Lindsay, that's a gorgeous cake 🙂 Never had an oatmeal one before, I'm totally intrigued! Another great guest post, Chef 🙂 Buzzed! Hi Lindsay!! Great to meet you! Your cake sounds fantastic! I am ready to jump out that door and head to the market for some blueberries…this cake needs to be mind asap! Dennis, what a treasure you are to the blogging community! I have met so many wonderful cooks via your Friday feature…and now I'm off to visit Lindsay's blog. I have two sick family members here…no fun in the summer! Feel better soon! Chef Dennis, please get some rest and hope you feel better soon. Lindsay, your recipe sounds wonderful. Great photo. What a great treat…thanks to both of you. Lindsay, thank you for the recipe, it has almond, oatmeal and blueberries, so it is a must do for me. I hope you feel better asap and that the summer flu goes away quickly. Thank you for sharing a wonderful cake recipe with us Lindsay! Excellent choice for a guest post, Lindsay. I enjoyed reading your story and the cake looks fantastic-I will now pop on over to your site. What a luscious looking cake… a great way to get kids to eat some healthy foods! Lindsay, I loved that you shared your story. It is so interesting to hear how others ended up doing what they love! I'm heading on over to your sight to read some more. Chef Dennis, I hope you feel better soon! And to Jill, my dear friend from Mad About Macarons, who left the comment above whining about the weather in Paris… you get no sympathy here! At least you are in Paris! Lol! I've never eaten cake for breakfast. This sure is such a great idea. A cake but with all the goodness crammed in. What a wonderful recipe! This would be great for a family breakfast. Thanks so much for sharing, Lindsay! Dennis, thank you so much for introducing me to Lindsay. I love the title of the blog – couldn't help be so intrigued at first, as honestly expected to see a knitted cake. Lol. This oaty banana cake looks sensational! Sorry to hear about the summer flu, Dennis. Hope you get better soon. If it helps, the weather in Paris just now is just awful, so wish we could have un soupçon of your heat wave (sob). love the idea 🙂 Looks sooo yummy! 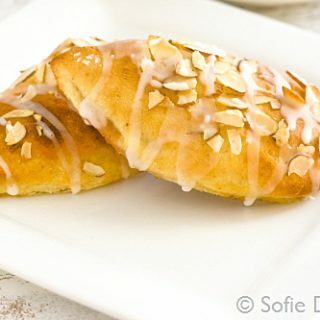 This is such a unique and yummy breakfast idea! I'm excited to try! Lindsay congrats on being a guest poster with Chef Dennis!! The breakfast cake sounds really good. My daughter loves oatmeal I think she'd really enjoy this too. Thanks! I love to eat cake for breakfast so this is definitely a winner for me! Such a great guest post. Thanks Lindsay and Dennis! 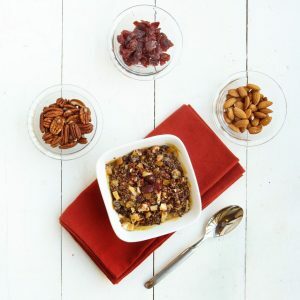 what a great recipe, and thanks for introducing me to a new blogger, heading to visit her now! Hi Lindsay! What a fun, tasty post! I love that you told us why you started your blog! I started mine because my doctor told me I had to eat healthy or suffer serious consequences. Baking is one of my loves, too…and something I've not been able to do too much of. This? THIS is lovely! I can't wait to try this – it looks delicious and healthy! Thank you….